You&apos;ve seen synchronized dancing and synchronized skating, but have you ever seen synchronized fireflies? To view the dazzling display at its brightest, come to the Elmont Campground in the Great Smoky Mountains National Park between late May and mid-June. Access is limited; tickets go on sale at the end of April. Check with the Park for availability. Did you know that the Smoky Mountains National Park is home to over 19,000 documented species of plants, animals, fungi, and insects? And that figure barely scratches the surface. Naturalists believe there may be as many as 100,000 species yet to be discovered. Why so much diversity? The Park&apos;s 800 square miles cover a wide range of habitats, at multiple elevations, with varying microclimates. These habitats support a huge array of distinctive flora and fauna, including rare and endangered species. 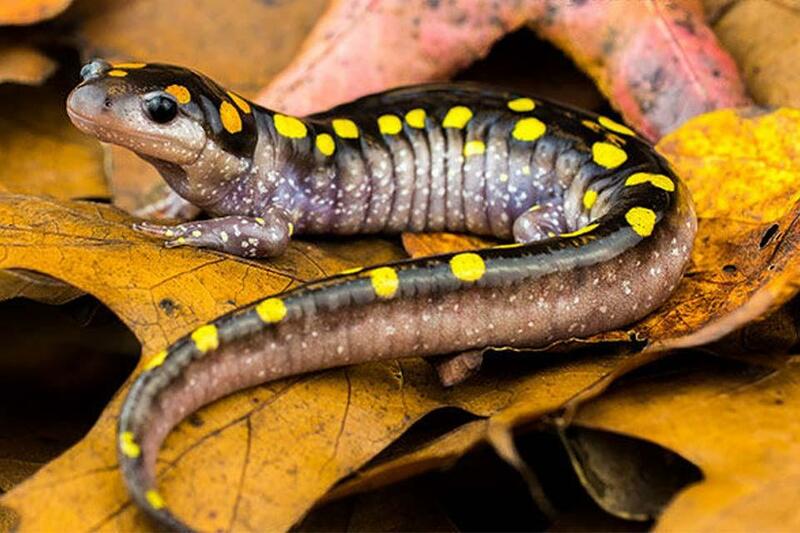 About 30 species of aquatic salamanders flourish in the Park&apos;s humid climate. True amphibians (not lizards), these sleek, slimy creatures include the Eastern Hellbender, the third largest salamander on earth. If you spot one, you&apos;ll definitely know it: A typical Hellbender can weigh between three and five pounds and grow up to 29 inches long. Usually brown or grey, it lives up to 30 years in the wild and up to 50 in captivity. Love flowers? You&apos;re in luck. The Smoky Mountains National Park is home to more flowering plants than any other park in America – over 1,500 in all, including colorful wildflowers, blooming trees, and brilliant, blossoming shrubs. From Spring Beauty and Bloodroot in early spring to Black-Eyed Susan and Turk&apos;s-Cap Lily in summer, you&apos;ll find vivid perennials galore. Many bloom at mid to lower elevations, so you can easily view them without braving a strenuous hike. About 1,500 black bears inhabit the Great Smoky Mountains National Park. Averaging 100 to 250 pounds, they can grow as large as 600 pounds and live up to 15 years. And, unlike their relatives in other regions, they truly are inky-black. Enjoy fishing? The Smoky Mountains National Park is an angler&apos;s paradise, with over 2,900 sparkling waterways, many teeming with native brook and rainbow trout. Almost 900 of miles of scenic trails crisscross the National Park, including the world-famous Appalachian Trail. Hiking trails range in difficulty from easy to arduous, so there&apos;s literally something for everyone. Whether or not you&apos;re a serious birder, you&apos;ll appreciate the vast variety of birds that nest and breed in the Park. At least 60 distinctive species live in the Smokies all year &apos;round, while many others come here to breed. In spring and summer, their songs fill the air, delighting tourists and natives alike. Are you familiar with Sacred Harp hymnody, the four-part a capella singing tradition that flourished in American churches before the Civil War? If you&apos;ve seen the movie Cold Mountain, you&apos;ve heard this hauntingly beautiful music. Right now, it&apos;s in the midst of a revival at "shape-note sings" all over America. And, it has come back home to Cades Cove, once a hub for shape-note "singing schools" (1870s-1930s). From time to time, experienced shape-note singers gather at the Cove&apos;s Primitive Baptist church to sing favorite "Old Harp" hymns, the Smokies&apos; distinctive version of Sacred Harp. Contact the National Park to find out when the next "sing" might take place. What comes to mind when you hear the phrase "Pigeon Forge-Gatlinburg"? If you&apos;re like most of us, you may think of popular attractions like Dollywood and The Island. But just a few miles from those world-famous sites, comfortable cabins and chalets nestle among shady woods and atop secluded summits... almost as though they were part of another world. At Smoky Mountain Chalet Rentals, for instance, you can book rentals ranging from cozy one-bedroom cabins to six-bedroom luxury lodges. All offer unparalleled privacy in wooded and/or mountaintop settings... along with choice amenities like whirlpool baths, hot tubs, fully stocked kitchens, fireplaces, and spacious home theaters. You&apos;ll find there&apos;s so much more to learn about the Great Smoky Mountains. But the best way to learn is through experience. So, pack up the car, gather the family, and head to the Smokies now.